Dutch Oven with spiral bail handle and iron cover, 7 qt. 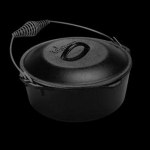 Hailed as a "Best Buy" by Cook's Illustrated Magazine, the Lodge Traditional Dutch Oven with Wire Bail handle has been popular for over a century, and is perfect for camp and hearth cooking. 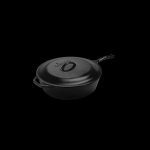 Dutch Oven with loop handles and iron cover, 5 qt. 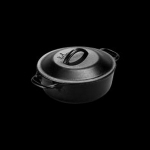 A favorite for cooks of all ages, the looped handles make it easier to move from stovetop to oven. 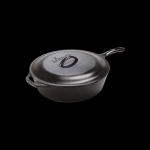 Serving Pot with Iron Cover, 2 qt. 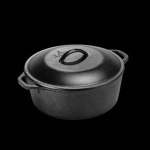 Lodge Two Quart Serving Pot with loop handles and iron cover is perfect for oven to table presentations of soups, stews, beans or any family favorite. Preparing food for a lot of people? 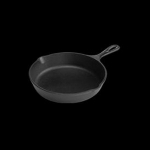 Our large skillets create recipe after zesty recipe, year after flavorful year at home, in restaurants or at campsites. 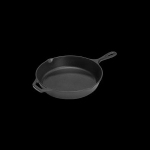 The Lodge 10-1/4-inch Skillet was rated as one of the two dozen essential tools in the home and kitchen (Martha Stewart Living February 2008). 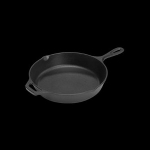 We have a size and shape to meet any of your cooking needs, with assist handles for easier handling. 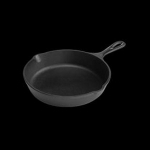 The 9" skillet is a great in-between size. Not too big for a smaller kitchen, but big enough to serve up a great meal. It makes a perfect batch of cornbread, and will for decades. 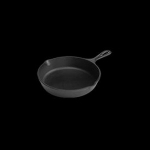 The perfect size to be your egg skillet. The 8" is one of our classics, and a must for any home. 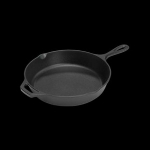 Smaller Doesn’t Mean Less Performance—Scrambled eggs, cornbread or seared chicken breasts are natural selections for these classic skillets. Chicken Fryer with Iron Cover, 5 qt. Known for their fryer power, Lodge Chicken Fryers are versatile vessels. 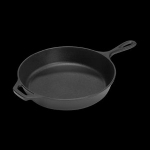 Combining a deep skillet with an iron cover, these pans excel in the oven, on the range, or over the fire. Chicken Fryer with Iron Cover, 3 qt.